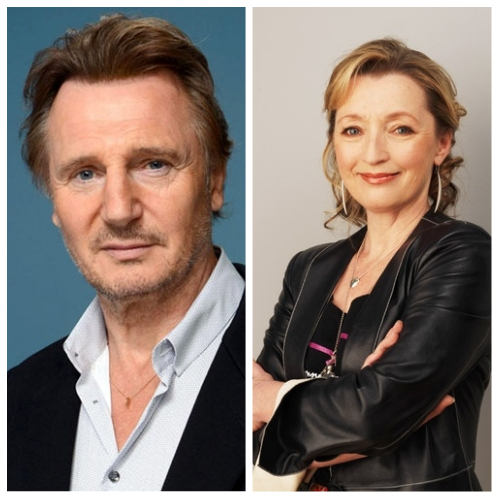 Liam Neeson (Taken, Schindler’s List) and Lesley Manville (Phantom Thread, Another Year) are set to star in NORMAL PEOPLE, directed by Lisa Barros D’Sa and Glenn Leyburn (Good Vibrations), based on the script by celebrated Irish playwright Owen McCafferty. A Canderblinks Films and Out of Orbit production, produced by the BAFTA award-winner Brian J. Falconer for Out of Orbit, David Holmes for Canderblinks Films and Piers Tempest for Tempo Productions. Joan and Tom have been married for many years. There is an ease to their relationship which only comes from spending a life time together and a depth of love which expresses itself through tenderness and humour in equal part. When Joan is unexpectedly diagnosed with breast cancer, the course of her treatment shines a light on their relationship as they are faced with the challenges that lie ahead and the prospect of what might happen if something were to happen to her. NORMAL PEOPLE is a story about love, survival and the epic questions life throws at each and every one of us. Principal photography commences in early July on location in Belfast, Northern Ireland. CAA, which arranged financing for the film, represents its domestic distribution rights, with Bankside Films handling sales throughout the rest of the world. “NORMAL PEOPLE is a project that is very close to all our hearts and working with Lisa, Glenn, Owen and David has been a constant inspiration to me. Bankside Films, Head Gear Films, Northern Ireland Screen and the BFI have been wonderfully supportive throughout and we could not wish for better partners in making this dream project become a reality” explains Brian J. Falconer. “It took me one year to talk Owen McCafferty into writing NORMAL PEOPLE and it took him two months to deliver his stunning first draft. I’m absolutely delighted to have Liam Neeson and Lesley Manville as our lead actors and my Canderblinks partners Lisa Barros D’Sa and Glenn Leyburn directing this beautifully profound love story” says David Holmes. Piers Tempest shared “We are delighted to be working with Brian, David and the team on bringing Owen’s powerfully relevant script to the big screen”. Natascha Wharton for the BFI, Phil Hunt and Compton Ross for Head Gear Films and Stephen Kelliher for Bankside Films will serve as Executive Producers. Head Gear Films, Northern Ireland Screen and the BFI, which is supporting the film with National Lottery funding, are the film’s financiers. Additional finance is provided by Christopher Reynolds, Newcastle upon Tyne based investment vehicle CR67 Limited. Stephen Kelliher of Bankside Films added, “We were immediately captivated by this beautiful love story which is sure to resonate with audiences around the world. We are thrilled to be bringing it to the screen with such a distinguished team both in front of and behind the camera”.